Now in its 8th year, the Dalkey Book Festival, presented by Zurich takes place from 15th-18th June and promises yet another stellar line up of internationally renowned writers from across the globe. (L-R) Patrick Manley, CEO of Zurich Insurance plc with David Mc Williams and Sian Smyth, Dalkey Book Festival Directors in Dillon's Park, Dalkey. The final countdown is on to the Dalkey Book Festival, presented by Zurich. The full 2017 event line up contains over 65 conversations, workshops and performances taking place between Thursday 15th and Sunday 18th June. Set in the beautiful seaside town of Dalkey, with its rich literary heritage, the festival is set to showcase some of the greatest authors and thinkers from across the globe, including award winning Novelist Sebastian Barry, Journalist and Author David Goodhart, Film Directors Lenny Abrahamson and Bruce Robinson, and Man Booker Prize winning author, Marlon James. The theme for this year's Dalkey Book Festival, presented by Zurich, is 'empathy through storytelling', with events spanning literature, politics, ideas, comedy, world affairs, theatre, film, history, medicine and more. Tickets on sale from €10.00. To learn more and buy tickets visit www.dalkeybookfestival.org. As part of the festival, Zurich is running competitions to win tickets to some of this year's events. To be in with a chance to win either two tickets to the sold out opening event with Sebastian Barry, or a pair of tickets to two other events, answer this simple question: How many years is the Dalkey Book Festival running? Send the answer to: social.media@zurich.ie. The closing date for entry is the 9th June and all entries will be entered into a draw. T&Cs apply. The promoter is Zurich Life Assurance plc. whose registered office is at Zurich House, Frascati Road, Blackrock, Co. Dublin. The competition is open to residents of Ireland aged 18 years or over except employees of Zurich Life and their close relatives and anyone otherwise connected with the organisation or judging of the competition. Closing date for entry will be 9th June 2017. After this date no further entries to the competition will be permitted. The rules of the competition and how to enter are as follows: entrants must send an email to social.media@zurich.ie with the correct answer to a question posted on the Dalkey Book Festival post on the Zurich Life blog - https://www.zurichlife.ie/blog/20170525-dalkey-book-festival/ . Zurich Life reserves the right to cancel or amend the competition and these terms and conditions without notice in the event of a catastrophe, war, civil or military disturbance, act of God or any actual or anticipated breach of any applicable law or regulation or any other event outside of the promoter's control. Any changes to the competition will be notified to entrants as soon as possible by the promoter. Zurich Life Assurance plc. is not responsible for inaccurate prize details supplied to any entrant by any third party connected with this competition. There are two prizes: one pair of tickets to the opening event at the Dalkey Book Festival, and one pair of tickets to another 'sold out' event. The prize is as stated and no cash or other alternatives will be offered. The prizes are not transferable. Prizes are subject to availability and we reserve the right to substitute any prize with another of equivalent value without giving notice. Zurich Life Assurance plc. will judge the competition and the winner will be picked at random from all correct and complete entries via email. The winner will be notified by email within 2 days of the closing date. If the winner cannot be contacted or does not claim the prize within 24 hours of notification, we reserve the right to withdraw the prize from the winner and pick a replacement winner. The winner agrees to the use of his/her name and image in any publicity material, as well as their entry including any photographs or images shared. Any personal data relating to the winner or any other entrants will be used solely in accordance with current Irish data protection legislation and will not be disclosed to a third party without the entrant's prior consent. The winner's name will be available 28 days after closing date by emailing the following address: social.media@zurich.ie . Our Ecocab drivers (see picture above) will be giving free lifts around Dalkey to festival goers on the Saturday 17th and Sunday 18th of the festival. They will also be running a competition to win a fantastic prize. To enter the competition you must approach one of the cabs and fill in a short competition entry form. T&C's apply, see Ecocab drivers for details. 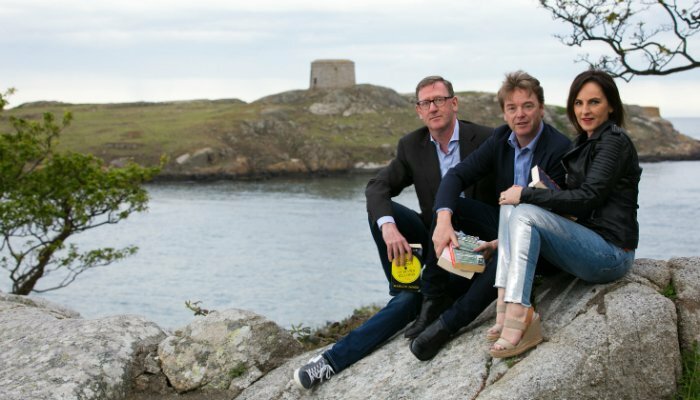 The Dalkey Book Festival presented by Zurich was set up by Sian Smyth and David McWilliams in 2010 and takes place every year in June and each year the festival hosts and impressive selection of internationally renowned writers and speakers.